For the first time since October 30, the Sabres scored more than two goals in a game. And, shocker, they won! Robin Lehner has caught quite a bit of undeserved flak, partially due to the price paid by Tim Murray to acquire him and partially due to a number of lopsided losses suffered by the Sabres with him in net. 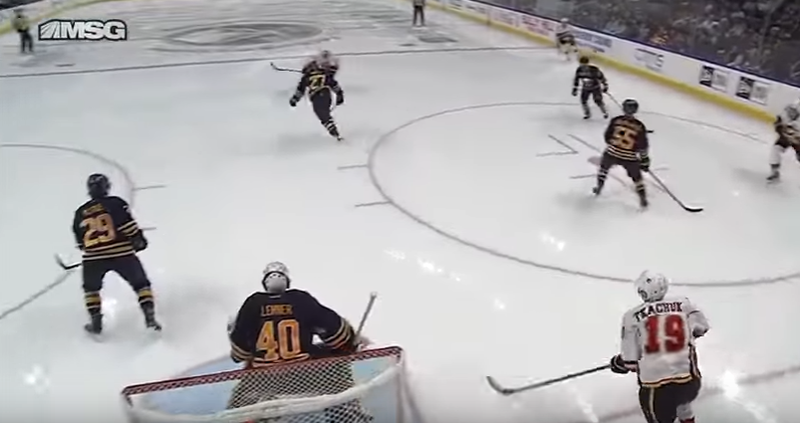 As discussed previously in this space, Lehner’s play hadn’t wavered so much as the play in front of him had dwindled. It’s no surprise that Lehner played an impressive game against Calgary and got a win when the team in front of him scored more than one goal. The game wasn’t without its warts as the Flames scored on a near tap in off a four-on-one rush, a play which Robin Lehner was exposed on something of a poor read. 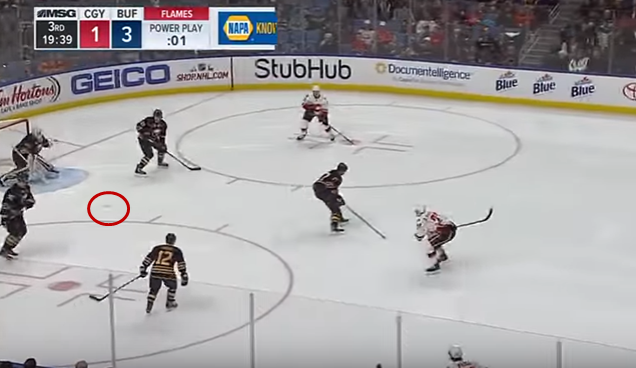 It seemed obvious that he didn’t expect the pass to Mikael Backlund to be as far outside the crease as it was, leaving him to make a desperate attempt of a two-pad stack as he came across the crease. It was a goal that he probably wasn’t going to stop even if he was technically perfect, as he simply needed to cover too much ground as the pass came across the crease. Otherwise I thought Lehner, yet again, looked the part of a proper number one goaltender. His numbers have ballooned a bit as the Sabres struggled last week, but he’s playing at far closer to a 2.00 GAA than his stat line shows. Still, only one or two games stand out as ones where you could say he played poorly, so there certainly shouldn’t be concern over the return they’re getting on this particular investment. The goal scored by Matthew Tkachuk was of interest to me for a couple of reasons. First, Lehner was left with few options on the play as Dougie Hamilton made a tremendous one-touch pass to Tkachuk. 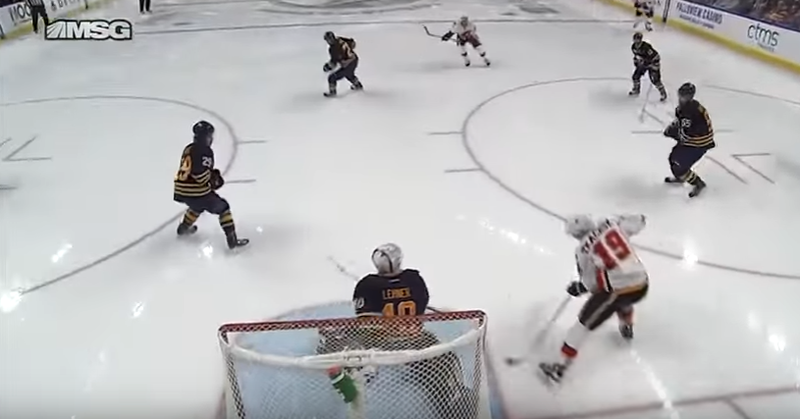 Second, despite the terrific pass and tip, Lehner nearly put himself in the position to make an impressive save on the play. At the center of this is Buffalo’s wonky penalty kill rotation where the forwards still take odd angles and seem to leave more lanes open than they shut down. Mark Giordano triggers this play from the half wall, skating down the boards and opening a lane to hit Hamilton at the top of the umbrella. 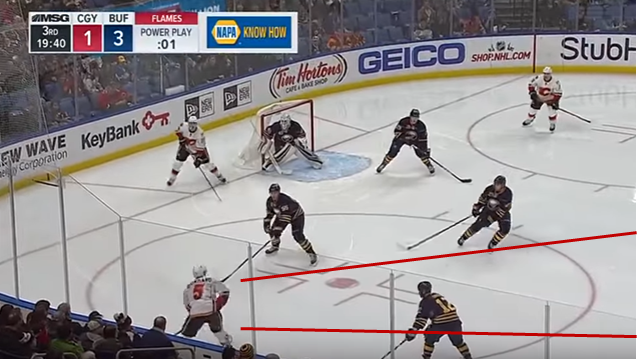 Lehner is in good position here, respecting the potential for Tkachuk to get the puck without cheating so much to tempt a shot. Note the lane available to Giordano to get the puck to a far more dangerous area. Perhaps this is an error on Gionta’s part as he pressured Giordana while he was higher on the boards. Still, it’s a strange way for the kill to rotate as Derek Grant is almost double covering the lane to the backside shooter with Jake McCabe. The puck gets to Tkachuk quicker than it does to Hamilton as the defender beautifully one touches the puck before any Sabres can adjust. Lehner quickly moves off the post to challenge the new shooter but the puck is nearly on Tkachuk’s stick by the time Lehner is halfway out of the crease. Don’t mistake this as a poor decision by Lehner either. Hamilton is a shooter here and Lehner needs to respect that threat. The end-zone camera gives a better illustration to the play Lehner makes on the first pass. 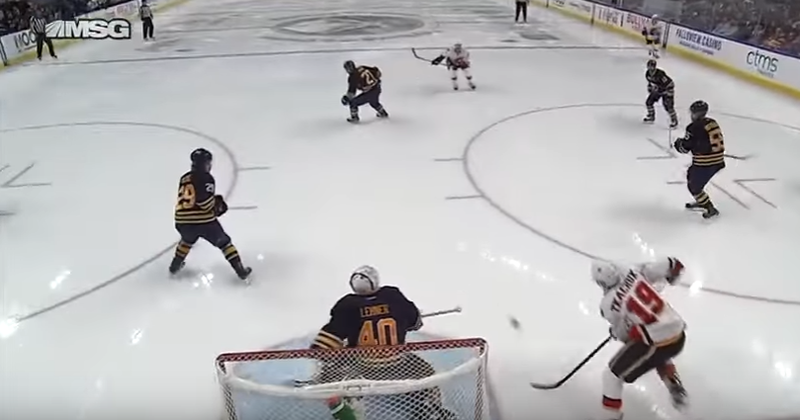 Lehner does well to change direction as the puck moves to his right, not just to halt his progress but change where he’s facing in relation to the puck. He gets his pad to the post quickly and eventually gets his body to follow but the quick nature of the pass and the perfect tip from Tkachuk eliminate most of the follow up movement. If Tkachuk didn’t get this puck up off the ice the way he did, Lehner probably makes the first save and possibly the second as well. Instead, Tkachuk executes, literally, the most perfect tip he possibly could. In the end it mattered very little as Marcus Foligno would add an insurance marker and Lehner would lock the Flames down for the remainder of the third. Lehner finished with 29 saves, giving the Sabres terrific support in picking up their second-straight win.